Where are you going to see them? any songs you particularly want to hear and see? We’re going to the first London date and I’ve seen them every tour since Zooropa. I dread to think how much we’ve spent going to see them! My fave song, especially live is a Streets. I hope you have a fab time. Welcome to the Zoo. They are better live than a person with high hopes can imagine. The crescendo and bright lights of Streets is reason enough to go. Of all places to see them live for the first time, it's Belfast? Sweet. I hope you have a great time. I must get some pitcures of the Concert. Even if you don't take pics-there will undoubtedly be a plethora of photos from the show(s) on U2.com. It's one of the many benefits of being a member. The shows are all very well documented on this site. You can look at past threads and see where there are live streams as each show happens. It's very exciting. Something to consider-it is possible to pay too much attention to the tour as one's own show approaches. I did that for Vertigo and knew what was going to happen before it happened. Many people enjoy doing this and knowing. I wished I had not. It's a matter of personal preference. The show was still incredible. Nothing can take away from U2 live. I wished I had left more of an element of surprise for that tour. I'm as excited for this tour, if not more so, than any of their tours. 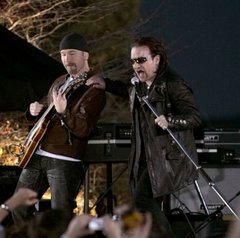 I am bringing this up as it is your first U2 show. I knew nothing of the IE shows and was very happy I did not. Others have a completely different approach, as I said. It's something you may want to consider or may not. I mention it in case you do. I did that for Vertigo and knew what was going to happen before it happened. Many people enjoy doing this and knowing. I wished I had not. Same. I tried keeping watching the DVD to a minimum before I saw Vertigo live, but then when the tour got postponed (and looked like it might not happen) I watched it to death. Even watched it the day before the show. Although there were changes to the setlist and stage setup I did kind of ruin it for myself. im thinking of not taking any pictures cause it distracts you from everything. Good advice. Like I said in another thread, I can remember pretty much everything from Popmart because I just took everything in. At Vertigo and 360 I was taking heaps of photos and it totally snaps you out of the moment.